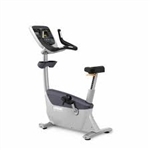 Check out our easy to read Precor Recumbent Bike Comparison Chart! Ergonomic Design: The seats are designed for comfort across a wide range of body types. 3-piece crank Pedals: The 3-piece crank tightens positively, reducing the need for periodic adjustments. The 9/16" crank arm accepts any standard road or mountain bike pedal. 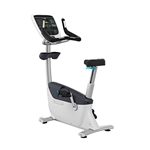 Recumbent Cycle Style Features: Full back support and a properly angled contoured seat provide maximum comfort. Recumbent cycling places additional emphasis on hamstrings and gluteus muscles. Display featuring Tap Control: Tactile paddles control resistance, confirming user input with a satisfying click. The multiple feedback options make it easy to monitor workouts.